Given the visibility of science in popular culture and news media, and ongoing debates about how communication influences the relationship between science and society, Media, Risk and Science is a timely book. As a welcome addition to the series Issues in Cultural and Media Studies (of which Allen is also the editor), this introductory text is ambitious in scope, not least because the prospective audience includes students of media and cultural studies, science studies, journalism, sociology and politics. The aims are also ambitious, dealing with representations of science, definitions of risk, threat and hazard, considering interpretations of media representations, and reflecting on what media and cultural studies can inform us about contemporary scientific controversies. The book is split into eight chapters, beginning with an introduction that rehearses arguments about the relationship between science and society and the reporting of risk in science coverage. Key to this chapter is the claim that the book contributes to the development of 'a conceptual framework for the purpose of engaging with several pressing debates in this exciting area of inquiry'; an admirable, if challenging objective. The following chapters begin this process by examining science fiction and popular culture, arguing, with good reason, that conducting analyses of popular culture can inform our understanding of the relationship between science and society. The following five chapters move the debate to reporting in news media outlets, beginning with a chapter on science journalism. This focus seems a little narrow given the previous chapter's discussion of science museums, films and books. It could have been extended to consider those involved both in the production of popular culture and news media representations, therefore investigating similarities and differences between these producers of representations of science. The remaining chapters draw mainly on examples from UK and US national print media outlets without making a case as to whether the author considers the media marketplaces in these countries to be comparable. In doing so Allen reviews a wide range of literature, mainly from existing empirical studies that consider reporting of physical, environmental, health and biological sciences. As such, the book comments on these issues, often characterising this reporting in terms of 'moral panics'. It is noted, briefly, that this concept has been critiqued. There is some discussion of primary research, and of how audiences interpret and contextualise popular culture and media representations. Where Allen draws together existing work, in particular his discussion of the links between fictional and factual representations, this work is interesting and informative. Indeed, where I find the book to be strongest is when Allen draws on arguments about how images from popular culture are used as shorthand to frame representations of science. The discussion and examples that illustrate how media reporting changes over time are also interesting and informative. There are a number of additional features that are useful, not least the addition of a glossary of key terms and the introduction of suggestions for further reading at the end of each of the chapters. As this is an introductory text, these are welcome additions. I would question the use of the quotations at the beginning of the chapters, however. Whilst some of these are helpful, they would surely better serve the arguments being developed if they were included directly in the text of the chapters. Whilst the literature from media and cultural studies is important with respect to understanding the role of science controversies, science studies also has much to say on this matter and this is under- represented. I feel that further consideration of the literature on the provisional, contingent and often contested nature of scientific knowledge, and how this is (re)constructed across a range of media could have been explored in relation to all the issues discussed in the book to good effect. Also, given the ambitious aims of the book I wondered whether the 235 pages could have been extended to include chapters specifically on interpretation and media influence, and a concluding chapter that drew together the key themes of media, risk and science, and the conceptual framework discussed in the earlier chapters. 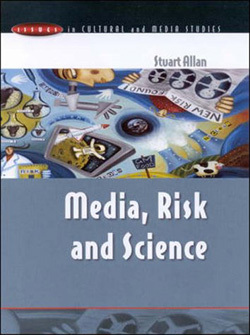 In conclusion, this is a timely introductory text that considers the relationship between media, risk and science. It draws together a wide range of existing literature on a range of key issues, examining science in popular culture and news media. In so doing, it reviews literature on a series of case studies, raising a number of key issues well worthy of detailed study.